“Books From the Bottom Shelf”. Discover these usually overlooked treasures that reside on our bottom shelves! Some of the books have some beautiful photographs and illustrations in them: “Louis L’Amour’s Frontier”, “Norman Rockwell: Artist and Illustrator” and “Alaska”. — at Central City Public Library. Have You “Red” a Good Book Lately? Looking for something to read during the very cold winter weather? If so, be sure to stop in and check out our “RED” books display! Library Closing @ 5:00 PM Today (Wed., Jan 29)! The library will be closing @ 5:00 p.m. today, (Wed., Jan. 29) due to power line reconfiguration. We will reopen Thursday, Jan. 30 @ 10:00 a.m.
Don’t forget that Nebraska Overdrive is always available, for you to download eBooks and audiobooks (using your library card #). Happy New Year’s Eve from the Library Staff! We will be closing @ 12:30 pm today and be closed New Year’s Day (Jan. 1). We will reopen Thursday, January 2 @ 10 a.m. The library will close @ noon on Christmas Eve (Dec. 24) and be closed Christmas Day (Dec. 25). We will reopen Thursday (Dec. 26) @ 10:00 a.m.
Merry Christmas from the library staff! — at Central City Public Library. O Christmas Book Tree! O Christmas Book Tree!.. Be sure to stop by and see our Christmas Book Tree (it’s definitely larger than last year’s tree)! — at Central City Public Library. Library Closing @ Noon Today in Observance of Veteran’s Day! The library will close @ noon today in observance of Veterans Day. While we are open this morning (10 am-noon), be sure to stop in and pick up a FREE patriotic pin or bracelet to wear at the parade this afternoon @ 2:00. Thank-you to our veterans for your service and sacrifice to our country! 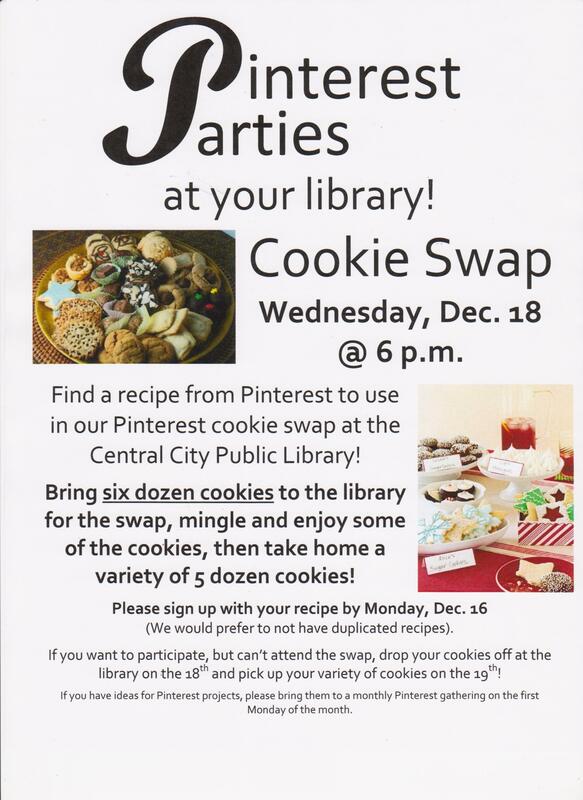 Pinterest Cookie Swap, Wednesday, Dec. 18 @ 6:00 pm! Bring six dozen cookies to the library for the swap, mingle and enjoy some of the cookies, then take home a variety of 5 dozen cookies. Please sign up by telling us what recipe you will be making, by Monday, Dec. 16 (we would prefer to not have duplicated recipes). If you want to participate, but can’t attend the swap, drop your cookies off at the library on the 18th and pick up your variety of cookies on the 19th! Stop By Our “Gobble Up Some Gourmet Reading” Book Display! Looking for some inspiration for your upcoming holiday cooking? Stop by our “Gobble Up Some Gourmet Reading” display! We have books on topics such as: creating beautiful table settings, baking delicious pies, tarts & hors d’oeuvres and selecting a delectable side dish to make. — at Central City Public Library. Christmas of Sharing Doll Quilts on Display @ Library!